Attend a FREE workshop at FIU April 1st – 5th, for more information and RSVP visit http://go.fiu.edu/NPHW2019 (see flyer attached). Join the Billion Steps Challenge and help the American Public Health Association (APHA) reach over a billion steps by the end of NPHW. Become an official NPHW Partner. Read these NPHW fact sheets on the NPHW daily themes and how we can build a healthier nation. RSVP to the official NPHW twitter chat on April 3 at 2pm ET. We’ll be talking all things public health with the hashtag #NPHWChat. 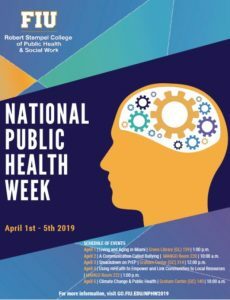 You can learn more about National Public Health Week at www.nphw.org. We look forward to celebrating with you!